Illustration by Lisa Larson-Walker. Photo by Getty Images. During my college years, there was only one entertaining rule in my very party-prone suite: Parties should be publicized as starting at 9 p.m., but no one should actually come before 10:30. The logic was both selfish and discriminating—the inner circle could have proper cocktails for a few hours before the rabble arrived, and, in any case, no party guest worth his vending machine-purchased mixers would possibly want to knock on our door until at least 1.5 hours in. Most people naturally grasped this implicit guideline, but a few times, certain clue-lackers would arrive right-on-freaking-time. They would be allowed to stay that night (we weren’t monsters, after all), but future invitations were not forthcoming. Avoid the fate of those sad souls—come with me as we study the art of timing and dispel the vagaries of the well-executed arrival. To start with, an easy but surprisingly abused rule: NEVER be early. Though other timing considerations apply differently to different kinds of events, this one is universal. A vignette for demonstration: You are preparing a dinner party for 8, which, because you are civilized, is meant to start at 8. Because you are what people call an ambitious cook (or as you like to think of it, a cook who cares so much for the pleasure of his guests that you go that extra, somewhat time-consuming mile), you are running just a bit behind. Things are generally under control, but you need every last second to get to a point where you can finish up the cooking while being charming with your guests at the same time (no easy feat). Then, at 7:45, a knock at the door. Your startled body jerks, causing you to fling the bowl of Spanish olives you’ve prepared as a cocktail nibble across the kitchen floor. Cursing quietly, you sweep up the oily orbs as best you can and hide the mess in the pantry closet. Who the hell thought it was a good idea to show up 15 min early? “It’s Betty,” a muffled voice reveals. You glare at Betty through the peep hole. “Why Sally,” she practically sings when you open the door, a strained smile plastered to your face, “I know I’m early, but I was already in the neighborhood and thought you might need some help. Put me to work!” Now totally thrown off your game, you can think of a few places you’d like to put Betty, and to work is not one of them. Moral of the story? If your host wanted you to be there at 7:45 to “help,” he would have said so. Don’t be presumptuous. That doesn’t mean you should arrive right on time, either. 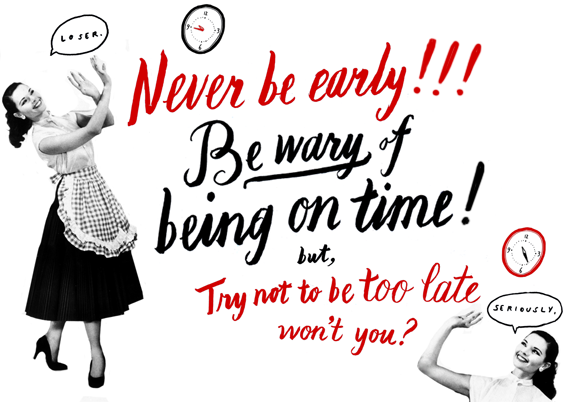 I realize this will be controversial in some quarters, but my firm belief is that a dinner, cocktail or house party or even an overnight guest should arrive late on purpose—but only a little. If you have hosted any function in this realm, you will know that an extra 10-20 minutes is always appreciated. Perhaps there was a time in the past when hostesses sat waiting in their perfectly clean parlors 10 minutes to curtain, smoothing the wrinkles from their gowns and worrying that the candles might not last the evening, but that is no longer the case. Modern entertainers—those servant-lacking, work-life-balancing angels who still muster the strength to be generous—need every moment they can get to finish up the cooking, neatening, and ambiance-orchestrating, so do them a favor and dawdle a bit before ringing the bell. But notice that I said only a little. Past the 30-min mark (outside of college, anyway), and you move into risky territory, especially if there are other guests in attendance. A few extra moments for cocktails and greetings before dinner will never be a burden to anyone, but if the food is ready and you are still “5 min away!” and already 45 minutes late, you have become, well, rude. Of course, more informal cocktail/house parties will be more flexible in this regard (there’s usually less “won’t-you-please-sit-down?” punctuation), but, if you’re dealing with people who have lives, arriving at 11 for a party that should end by midnight is pushing it. Planning your arrival within hour-one is a best practice. An easy way to remember all this? Do be tardy for the party, but, as in all matters of elegance, not too much.